It seems that as soon as Fall starts, people begin to really struggle to keep their body systems healthy. No doubt this is due to so many environmental factors, including less sunshine/Vitamin D, lots of kiddos in close quarters/school versus the lazy days of summer, and the amped up sugar season. So let’s Fall Into Wellness and learn how we can combat that time of year that so many people dread. There are lots of reason why you might choose to use essential oils this winter. 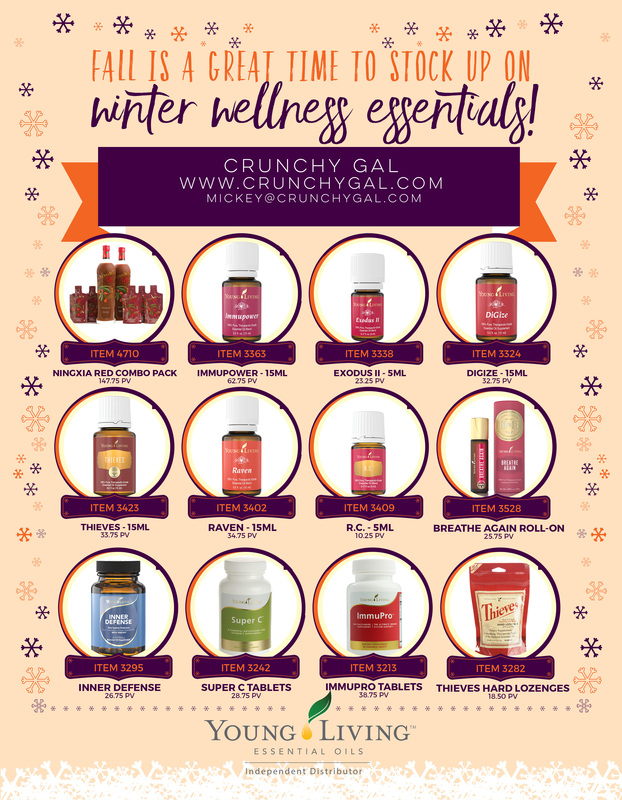 Here are my top reasons for choosing oils this fall and winter! * I prefer a natural choice for my family. * Oils creates an amazing proactive approach to my healthcare! * Using oils is fast and convenient. We are a super busy family so this is very important! Of course you should do the standard. Wash your hands often, get lots of sleep, boost your garlic use, drink bone broth, but here are some oils and oil-infused products that can help you with your wellness goals! This is Young Living’s super fruit supplement, made with wolfberries from the Ningxia province of China and supercharged with Young Living citrus essential oils. Just a 1 oz. 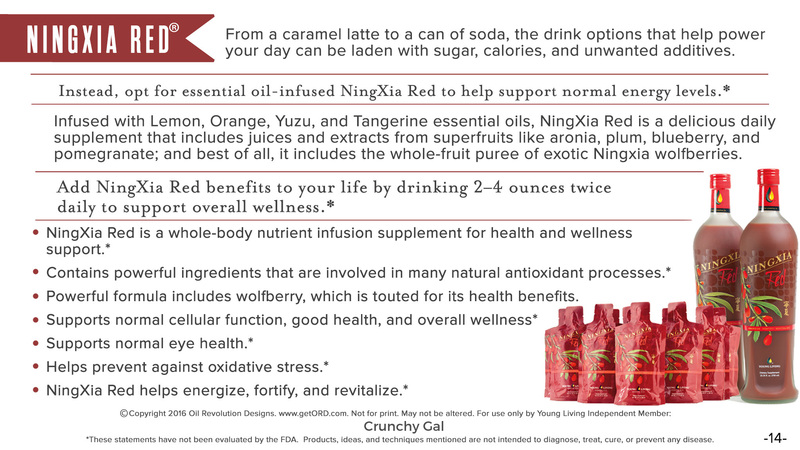 shot of NingXia Red supplies the body with vital antioxidants that provide a natural energy supply. This drink was developed after Gary traveled to the Ningxia province of China in his search for cultures with vitality and longevity. 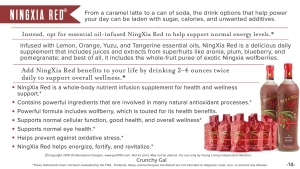 He found it in the Ningxia wolfberry! Not only does this drink support whole-body health, but it contains d-limonene, and the touted wolfberry, which makes this a great daily supplement. This is an incredible, powerhouse blend you are going to want on your body: Hyssop, Mountain savory, Cistus, Camphor, Frankincense, Oregano, Clove, Cumin, and Dorado azul. Keep in mind this is a very HOT oil so please dilute well if applying topically. 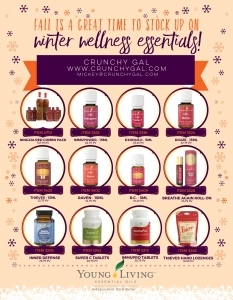 This is one of the things we do in my household nightly during the Fall and Winter months and I can tell you we have maintained our awesome healthy and wellness status since I started integrating our immune support routine. Since this is not the cutest smelling oil to me, I like to rub on the bottom of our feet then put socks over them. If you do not have rollerballs, I cannot highly recommend grabbing some cobalt blue ones from Amazon they make life easy, and my kids can oil themselves! This blend is akin to “Thieves on steroids” 😉 It smells awesome, definitely the cinnamon is what stands out to me. Although I know some people feel this smells really woodsy. But be aware – it is a very hot oil. And considering it has frankincense, myrrh and cinnamon – this is a power packed essential oil blend for a great price point. This is another great oil to have on hand. 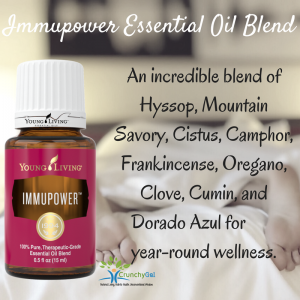 Diffuse Exodus II or ImmuPower (or both) essential oil blends in your workspace or home to provide a comforting atmosphere during the fall and winter months. 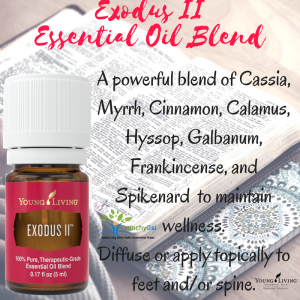 The name Exodus II contains cassia, myrrh, cinnamon, calamus, hyssop, galbanum, frankincense, and spikenard. It gets it’s name because the oils in this blend were thought to be used by Moses and the Israelites to protect themselves and promote wellness. 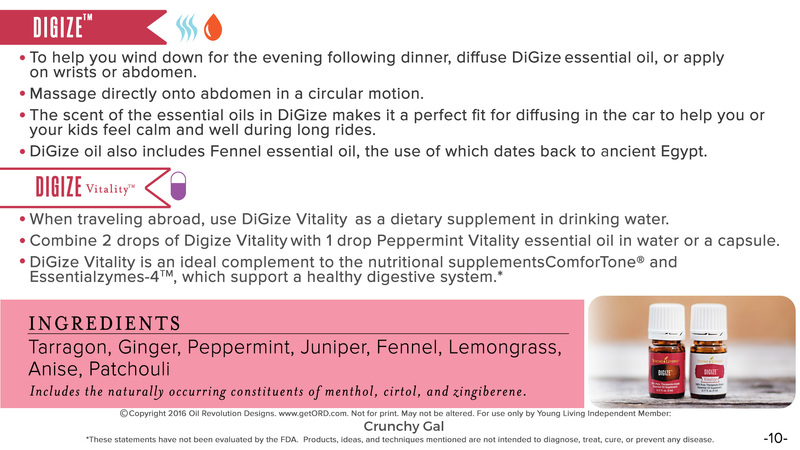 Digize is a blend of tarragon, ginger, peppermint, juniper, fennel, lemongrass, anise, and patchouli oils. This is a great oil to mix with a carrier and rub on the navel or on the bottom of the feet to promote healthy bathroom function. We also use this on my littles’ tummies when we are traveling or riding in the car for a while. Thieves is a powerful blend of Clove, Lemon, Cinnamon, Eucalyptus Radiata, and Rosemary essential oils, inspired by the legend of four 15th century French thieves. Crafted in the spirit of that legendary combination, Young Living’s one-of-a kind Thieves blend includes the naturally occurring constituents limonene, eugenol, and eucalyptol. This is a great oil to put in the diffuser during the cold and flu season, and I love using this diluted on my kids spines or on their feet. Plus I love the smell of this oil because it’s like Christmas in a bottle. 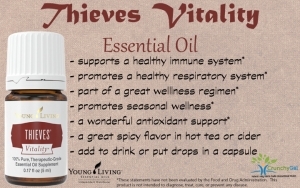 Thieves Vitality is known as the preventative blend. I use the Thieves Vitality on a daily basis to maintain healthy immune function and support healthy cardiovascular function! I am drinking it in apple cider right now and do almost every single night. We also diffuse this every morning while we are eating breakfast. 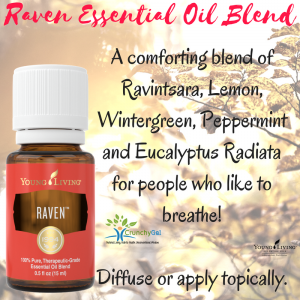 Raven™ is a cleansing blend of peppermint, ravensara, wintergreen, Eucalyptus radiata, and lemon essential oils and is deeply soothing to the chest and throat. Add it to the diffuser when you want continuous support. 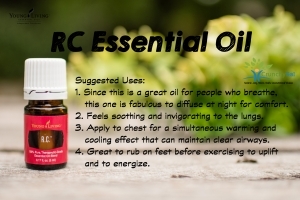 RC is a blend of Eucalyptus, Myrtle, Marjoram, Pine, Lavender, Cypress, Spruce, and Peppermint. This is an incredible oil for people who breathe. It is great for maintaining clear air pathways, allowing feelings of deep breathing. 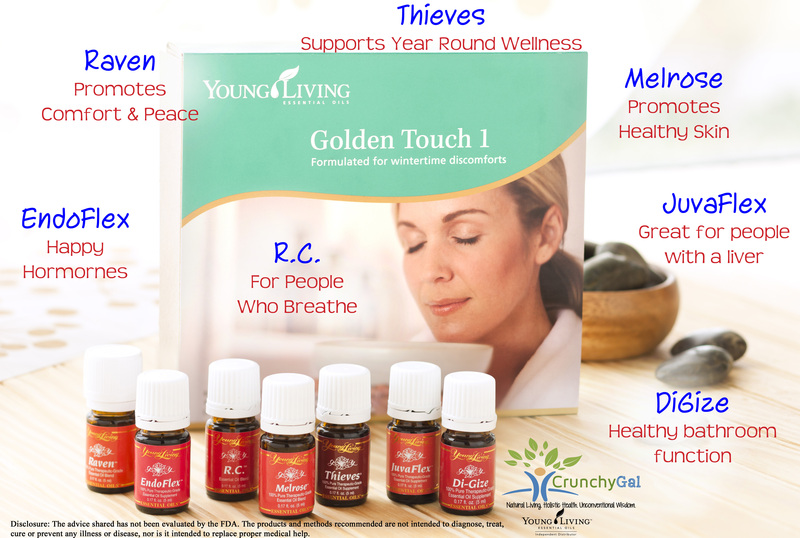 This kit has some of the oils we just talked about, and is a wonderful value that will save you money. It includes: Di-Gize, EndoFlex, JuvaFlex, Melrose, Raven, R.C., and Thieves blends. Melrose is amazing for for maintaining healthy skin. I love RC and/or Raven for promoting feelings of clear breathing and providing an environment of comfort. Juvaflex is a great oil for anyone who has a liver. Endoflex is wonderful for happy hormones, increased energy and a positive well-being. 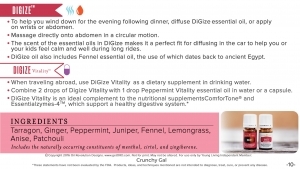 DiGize is necessary for healthy bathroom function, especially during all the upcoming holidays. Thieves – well – you need MORE Thieves always. Wow there is just so much to know in order to Fall Into Wellness! I had to pause here, but you can find the second half of this post about Fall Wellness here. Now I want to hear from you, which product are you most excited to integrate into your fall routine?